The City Limo provides an amazing service throughout the Quad Cities area. We offer service in amazing limousines and clean party buses. We offer Bluetooth or Aux capable sound systems and LED lighting in all of our vehicles. Select vehicles include 12v (USB and Cigarette lighter) outlets for passengers to charge their phones en-route. 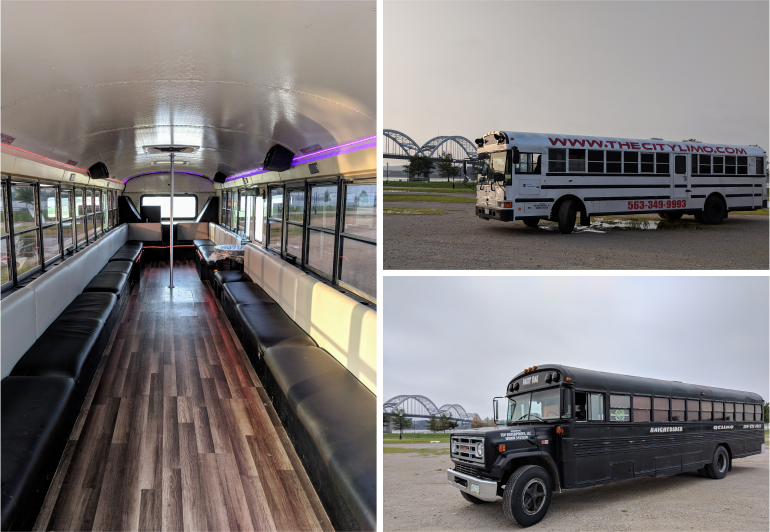 Our vehicles undergo weekly industry-standard maintenance programs and are the cleanest party buses and limousines in the area. All drivers are fully CDL licensed with passenger endorsements. Chauffeurs at The City Limo are screened for strict USDOT and FMCSA standards, take random drug tests, and maintain impeccable safety records! Our drivers treat each passenger with respect and friendship, and are not the stereotypical grumpy driver yelling at people. We want to ensure that your party is an event to remember and that you’ll book again with us in the future! Striving To Bring Luxurious Service At Economical Prices. Reserve For Your Event Today! Please drink responsibly, let us drive for you! NO added fuel surcharges in the QC area! Gratuity is always optional, you choose to tip your driver based on your satisfaction with their service! The City Limo revolves around Excellent Customer Service! Fully licensed and insured! Check out our SPOTLESS DOT record here! We bring luxury service at economical prices. © 2019 The City Limo.